Begin the 30 Day Gratitude Challenge NOW! Check your inbox bright + early each morning for your challenge emails! One of the best ways to welcome abundance + happiness into your life is through the regular practice of gratitude! This simple habit is as easy as waking up and saying THANK YOU before your feet hit the ground. 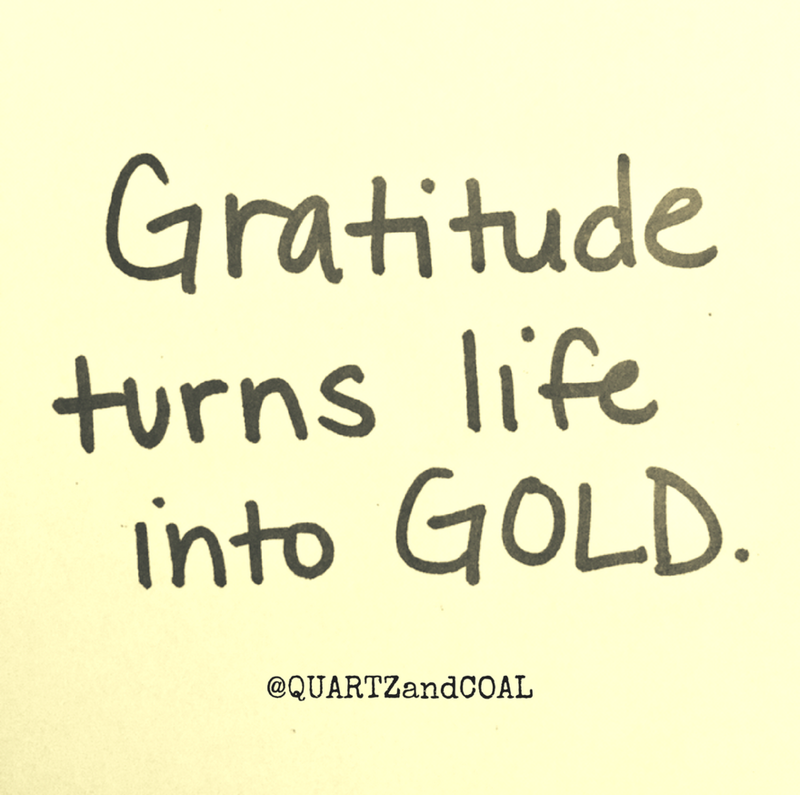 Take the challenge to enrich your day with a grateful Heart of Gold. AND share-worthy links for special videos, articles, tools and other amazing finds from the interwebs to help you practice more gratitude in your life! Once you sign up, your Welcome Packet will arrive in your inbox with a mini printable workbook, including a few pages right out of my gratitude journal for you to fill out each day! Print out your workbook each week and prepare to feel super grateful. You’ll receive an email first thing each morning (no weekends) for 30 days with your daily challenge. This practice got me through 10 years of ups + downs—unemployment, overwhelming debt, loss of loved ones, relationship struggles, unbearable jobs, scarcity mindset, anxiety, depression and even good times when I needed a reminder of how truly lucky I am to be alive! When I started my gratitude journal, I sent it back + forth with an old friend every morning. We shared words of encouragement + motivation with each other. We solved many problems together and learned more about each other through the process. She helped me stay accountable, and now I'm here to support you too! When you feel like sharing your words + experiences simply hit reply to any of the challenge emails or send me a DM on Instagram. I’ll be there to personally reply anytime you reach out. One big change I’ve made to my gratitude journal has been removing the wants/needs/get rid of sections and replacing them with things to learn + work on and things to release + let go of each day. These intentional sections are kind of like a mini moon ritual each day! It takes less than 10 minutes. Allow yourself to open up + dump the contents of your brain, creating space + lightening up to easily begin taking action afterwards. You have the choice to dig deeper and take time to meditate on your answers while seeking guidance as you complete this short journal page. Simply turn the page over to free-write on the back or continue your writing in a separate notebook. Sound fun, interesting, helpful, intriguing, motivating, just plain old good? Sign up today! Gratitude is synonymous with thankfulness + appreciation, but when I think of gratitude I think about valuing what is important, not just acknowledging it. It's easy enough to express your gratitude by saying thank you, sending a nice note or sharing a special gift with someone to let them know how thankful you are for them. When you say thank you, it can brighten someone's day. It might simply come and go, but when you are grateful for someone or something you make a point of taking care of it. The things you value in your life say a lot about you. They tend to make your life easier, but sometimes harder. Taking time to think about what you are grateful for offers a great deal of clarity around what is useful and what isn’t useful. Learning something new each day is also an important part of growth. It’s important to make space for growth to occur by clearing out clutter--physically, emotionally, mentally, spiritually and metaphorically--to welcome personal + professional expansion. You can do this by literally getting rid of stuff, practicing forgiveness, releasing pent up resentment, shame, regret or other things trapping you in the past. You can even try magickal techniques such as banishing or cleansing rituals. Gratitude helps you let go of the heavy burdens you are carrying. The trappings of a scarcity mindset look a lot like hoarding. Constantly worrying about not having enough amounts to piles + piles of useless stuff, just in case because you never know when you might need it. If you get rid of it, I promise you'll survive. You’re a resourceful, thoughtful human capable of figuring out any problem. You've made it this far, haven't you? Take a moment and tell your past THANK YOU for getting you here. Thanks in advance for joining me!! !